In transition metal compounds the metal ions are separated by large distances which rule out direct magnetic exchange interactions between the metal sites. The hybridization of the metal states with valence orbitals of the ligands opens the possibility to exchange electrons over longer distances, between the metal sites via the ligand. For instance, in FeCr2S4, the 3d3 ions of the Cr3+ sublattice, situated on octahedral (Oh) sites, and the 3d6 ions of the Fe2+ sublattice, located at the tetrahedral (Td) sites, can exchange electrons through S 3p states (see figure below). We demonstrated that the spectrum of orbital excitations measured at the Fe sites at the L3 resonance, displays dd excitations excited on the Cr3+ sites. This clear signature of superexchange indicate that orbital excitations can be excited on the chromium sites even when the energy is added on the iron sites in the inelastic scattering process. Multiferroics are materials that display simultaneously ferroelectricity and magnetic order. 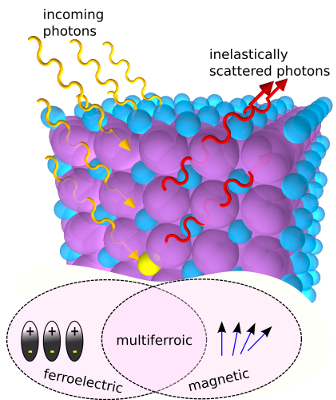 Due to potential technological applications and the discovery of compositions with strong coupling between charge and spin degrees of freedom, multiferroics have recently sparked considerable interest. In structures with spiral or helical magnetic ordering (multiferroics of type II), the charge disproportionation is supposed to arise solely from multiferroic coupling, independently from the electronic structure. Using the resonant inelastic x-ray scattering (RIXS), we studied the orbital excitations for compounds of the the RMnO3 family and were able to describe the crystal field acting on the Mn sites with unprecedented precision.